Saga Dawa is celebrated on the full moon day of the fourth Tibetan Lunar month according to the Buddhist Lunar Calendar. It is also celebrated in Nepal and in Sikkim in India by the Mahayana Buddhists. 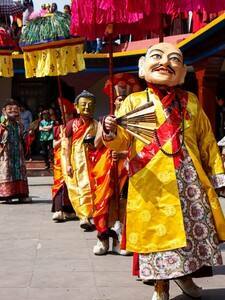 Saga Dawa is considered the most important religious festival among these Buddhists. It is a spiritual festival and people spend time praying and meditating but also in celebration. Saga Dawa commemorates the three things that the Mahayana Buddhists believe in - Lord Gautam Buddha's birth, his enlightenment and ultimately salvation. The Saga Dawa 2017 falls on June 15. | Festival calendar for June 2017 in India; chose your destination to enjoy the most!